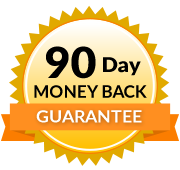 Already own the DVD Polarity Therapy? Call us at 1-800-364-5722, 9am to 5pm, to discuss your enrollment options. Add knowledge of Polarity Therapy to your practice. Based on the groundbreaking work of Dr. Randolph Stone, Polarity Therapy is a powerful energy healing modality. 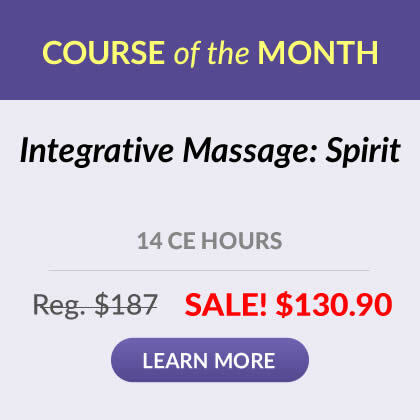 In this course, Mary Sullivan LMT, MA (Polarity and Acupuncture practitioner/instructor) will explain the three principles of Polarity Therapy: the Female or Water Principle, the Male or Fire Principle and the Etheric or Joint Principle, including how to evaluate the five elements: Ether, Air, Fire, Water, and Earth and how they relate to your client. You will learn the three currents of energy: Transverse Current, right to left; Bipolar Current, head to foot; and Umbilical Current, from umbilical area to connect with sun energy. Also covered are the three modes of touch: Satva or light touch, Rajasic or activating touch (rocking, moving), and Tamas touch, which is a strong, deep touch used to remove blockages of energy. You will learn techniques for balancing the flow of the body's energy currents in various areas (or positive and negative poles) of the body. You will see video demonstrations of how to balance your clients using the Five Pointed Star, the Six Pointed Star and the Joint Balancing Session. Included in this course is the course manual and one DVD entitled Polarity Therapy, Five Elements & Three Principles. The video presentations clearly demonstrate the techniques and give you a variety of close-ups detailing the work. Besides practicing along with the video programs, the manual offers several practice activities to further enhance your learning experience. Excellent course! New info on a whole new system I was not familiar with. So systematic and comprehensive. Valuable and mindful material that I will integrate into my practice. I love the deep and spiritual flavor of this work. I loved this course! It resonates strongly with me and the work I do. I would recommend this to anyone who is interested in Energy work. I found this course to be one of the most interesting ones that I have taken. I will strongly recommend it to anyone who is interesting in adding polarity therapy to their practice. I am anxious to go back and read it again when I can spend more time studying it. Thank you for making this excellent teacher and course available for home study. Thank you for coursework that is inspiring, educational and holistic (mind/body/spirit)in approach! Very simple process from start to finish. 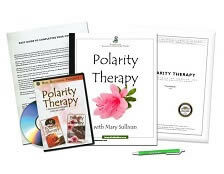 Polarity Therapy home study course is very thorough. I also took classroom Polarity courses along with this home study course, and they complemented each other well. Very interesting, held my attention. I already do another form of this work, so now I can perfect my treatments further. Great courses, great company with terrific support staff. Thank you so much!